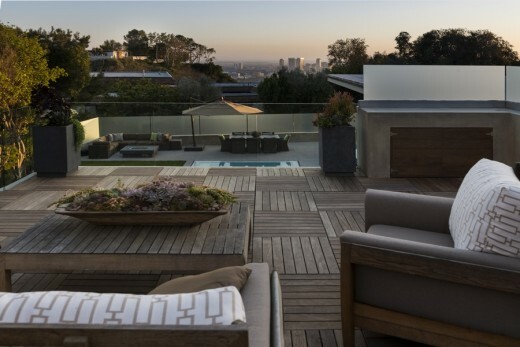 The Wallace Ridge House project began with former clients’ wish to move back closer to the city of Beverly Hills. They had found a potential property in Trousdale Estates and showed it to Marc for his advice on its possibilities. The property was in disrepair; had a choppy floor plan, and gabled roofs that did not fit the client’s vision of a modern home. The goal, of course, was to maximize the views while creating fluid well-lit spaces that would both serve and reflect the lives of the inhabitants. 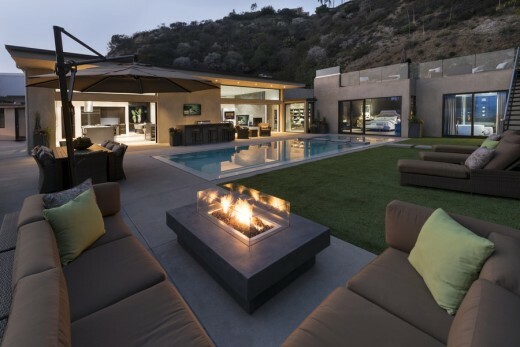 Marc saw a way to stay within the Trousdale Estates’ single story 14-foot height restriction and still provide spaciousness and a spectacular view. The entire core of the house was redesigned to feature an open plan, high ceilings and a sleek flat roof. The front door, flanked by large glass panels opens to a wide entry- a perfect stage for a piano – and provides an open sight line across the living area, though 12-foot glass walls and 8-foot glass sliding pocket doors, to the patio and pool. The clients do a lot of entertaining and required a kitchen that was open to the living and outdoor spaces. Rooms are minimally defined using tall panels, custom stained in a rich coffee bean brown, that contrast with the light walls, spaces suited to artwork. The warm modernism the clients wanted was achieved with a harmonious use of materials as kitchen, dining, entertaining and living room spaces flow easily into one another. In the living area a large screen television and fireplace are recessed into wall-sized expanse of Portico Slate tile by SOLI. In the kitchen, the island and countertops are Caesarstone in Lagos Blue and cabinets have an acrylic lacquered finish. Large glass pocket doors open to the outside from both kitchen and living areas, where there is a patio bar, conversation areas and a tabletop fireplace all encircling the pool. 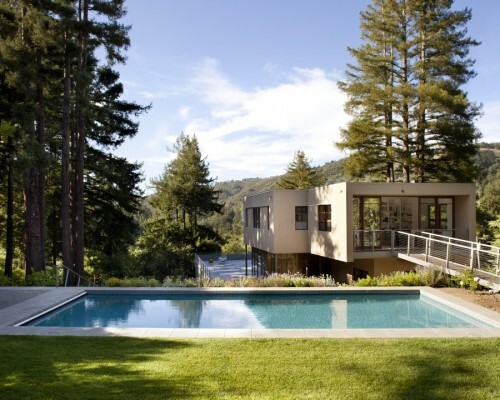 The master suite also opens to the pool though large sliding glass panels. To create a vantage point for the best view, a roof terrace was built atop the master suite, accessible from the pool area. The master terrace provides space for entertaining, sunbathing, a game of table tennis, and a view all the way to the Pacific. Below, the master wing offers a library/sitting room, and a home theater. Next to the bedroom, the master bath continues the use of brown with the tile in the master shower – a basket weave pattern from SOLI. Adjacent is a roomy closet/dressing area.